Dynamic Design and Manufacturing, Inc. offers custom precision CNC milling services, specializing in process control instrumentation, medical, telecommunications, aerospace, and national defense applications. A leading Colorado metal fabricator, we provide milling and machining services for clients worldwide that meet their exact requirements and tolerances. 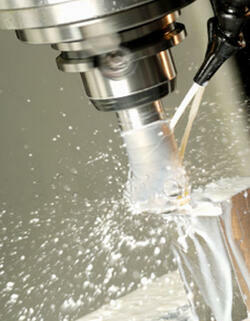 Dyco is equipped with several machining centers and mill machines, able to machine to tight tolerances. Our expert engineering and production staffs are supported by our company-wide commitment to quality and customer satisfaction. At Dynamic Design and Manufacturing we are proud of our reputation for manufacturing the highest quality precision machined parts that meet or exceed our customers' expectations. Our 31,000 sq. ft. facility located in Niwot, Colorado is equipped with multi-axis CNC machining centers and Wire EDM equipment, offering efficient precision custom machining, drilling, milling, boring, contouring, and surfacing of simple and complex shapes. They offer excellent repeatability and are able to work to fine tolerances, ensuring that your finished product will meet your required specifications. Our automated CNC machining and Wire EDM equipment is integrated with our laser cutting, punching, forming, rolling, welding, hardware installation, and finishing equipment to provide complete machining and fabricating services. We offer CNC milling for a range of materials, specializing in stainless steel milling, carbon steel, aluminum, nickel alloys, titanium alloys, and plastics. We have the capacity to produce quantities from prototype through high-volume production runs. Dynamic Design and Manufacturing is ITAR compliant and our manufacturing processes are ISO 9001:2015 certified so you can be assured that your parts will meet or exceed the quality and workmanship you require. Our engineering staff can work with you to achieve the most cost effective design for manufacturing and our experienced production staff will manufacture your parts to meet your specific requirements.